Spatial presentation of cartographic, geo-referenced surface - enriched by 3D models from UAS surveys - offer outstanding posibilities for presentation of your project planning status. 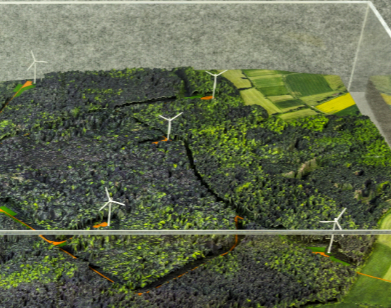 Visualize technical information and functions within the surrounding terrain through high resolution 3D printed models. In addition to the current building, vegetation and terrain status we can integrate GIS and CAD planning data, convert LIDAR and LoD to 3D models - always accessible to you through our 3D print preview service. Models from SHAPEwerk are composed of surface geometry, full color surface information and technical miniatures. For examples of stunning models produced click here .